Breakdown Tool Van 66 was built in 1921 and first allocated to Taunton. In service these 6-wheel Tool Vans carried a large selection of equipment and lifting tackle, and were paired with Riding/Dormitory Vans such as GWR89. They were vacuum-braked to permit fast running to the scene of accidents and breakdowns on the railway. 66 was originally gas lit and when preserved, all the fittings apart from gas mantles and light shades were still intact. 66 arrived on the SVRSevern Valley Railway in April 1976 from Ashchurch. It was owned by the Erlestoke Manor Fund until 1985, when it was put up for sale. It was then acquired by the GWR 813 Preservation Fund, and initially put to use as a tool van by the P.WayPermanent Way Department. 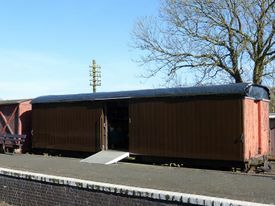 GWRGreat Western Railway 66 is situated at Hampton Loade where it is used by The Barry Railway Carriage Trust as a sales vehicle. This page was last modified on 9 April 2019, at 16:02.